Perfume held their first ever Tokyo Dome live show today on November 3rd, called, "1 2 3 4 5 6 7 8 9 10 11". �Tickets for the concert were sold out immediately after they went on sale, leading the electro-pop trio to perform before a packed audience of about 50,000 fans. As soon as the curtain raised and the opening sound effects were streamed, the three entered the arena and made their appearance in pure white dresses.� They opened the show with their hit numbers "Fushizen Girl" and "One Room Disco," to which the trio danced and pushed the audience to a dramatic climax.� The encore performance was the debut of their new song, "Nee," which will go on sale next week on November 10th. 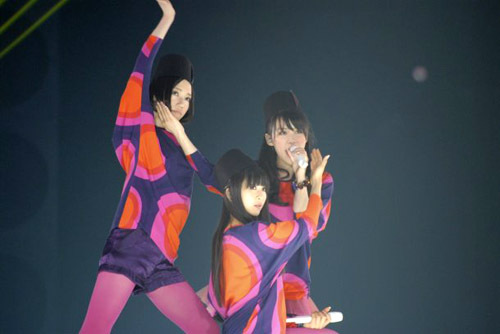 Not only was this a momentous first stage for Perfume at the Tokyo Dome, it was also a celebration of the 10th anniversary of the formation of the group. Besides their Tokyo Dome lives, Perfume will also be going to the November 28th "2010 Mnet Asian Music Awards (MAMA)" held in Macau.� They will be performing at the Venetian Macao-Resort-Hotel Arena, and it will be their first stage outside of Japan.� MUSIC ON! TV in Japan will be broadcasting the performance live.